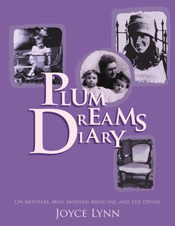 In Plum Dreams Diary, Joyce Lynn surmounts life’s vicissitudes on the wings of nocturnal poetry. Through words, images, and symbols, she takes the reader on a woman’s search for fulfillment in a world of confusing cultural messages. She shares insights about mothers, men, modern medicine, and the nature of the Divine. Honest and humorous, this collection of dreams reveals perceptions of the contemporary female Psyche. The dreams invite the reader to listen to her own sleeping mind. Journalist Joyce Lynn writes and advocates about the power of dreams to transform women’s lives.